The choice a couple makes when it comes to wedding rings is important on two different levels. First, wedding rings are an important expression of a couple and their pledge of lifelong fidelity and love. Second, wedding rings are worn for a lifetime and must therefore be chosen in styles that will be both timeless and chic. There are a few core decisions that need to be made when it comes to a couple's wedding bands. 1. Diamonds - They are said to be a girl's best friend, but plenty of couples decide against including diamonds and instead go with a well-chosen gold band for both the man and the woman. While a diamond is often the central feature of more traditional engagement rings, eliminating the diamond allows for a more elaborate design on the bands themselves. 2. 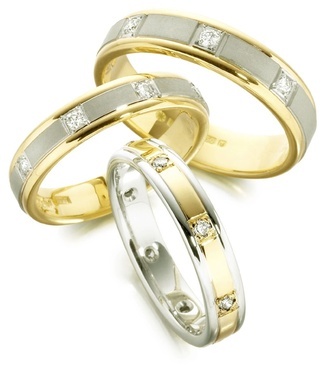 Metal - There are three primary choices for wedding bands: Gold, platinum or silver. While these are not the only metals available to couples, they are by far the most widely used metals of all. The metal you choose is a huge determining factor in the overall look and style of your wedding bands. 3. Matching - Every couple must decide whether they want their wedding bands to match or not match. This goes for the engagement ring as well as the bride and groom's wedding bands. Some couples opt for individual non-matching expressions, while others prefer the aesthetic continuity of matching ring sets.